So my sister and I treated each other, for our birthdays, to a cooking class at the Sur La Table outside of Cleveland. It. Was. So. Fun! Our chef was totally awesome, the food was so good I can’t even believe we made it and the store had some really cool stuff, too. I wasn’t even going to buy anything but I ended up finding a wire cooling rack, some new tongs and this cute little cookie/cracker tin in the clearance section (woot!). I actually learned how to dice an onion the proper way by keeping the root intact and slicing down the natural lines of the onion, then chopping perpendicular to those line. Helloooo, how have I not known this all my life? I felt like such an amateur but hey, it’s never too late to learn the proper techniques. Actually that’s a shallot. Fancy right? What else? I learned that you do not need to cook pork to the impossibly high temp of 160˚ in order to eat it as all pork packaging would have you think. Do so at your own risk and what not, but CHEF SAID a little rare is OK. God, if I could only have back those extra half hours I have cooked my pork only to fall short of the 160˚ mark every time and end up with a chewy, dry roast. Oh well. Now I know. We cooked these scrumptious prosciutto-wrapped pork medallions for 3 mins on each side. DONE and in the mouth in 6 mins. And I am still alive to tell about it. All of the recipes we made were from Ina Garten’s Make Ahead Cookbook. (A.k.a. Barefoot Contessa) I’m telling ya, that chick knows a thing or two about the kitchen. Wowz. The green bean salad with the goat cheese pocket was my favorite part of the meal we made. See, I love the idea of health food but then I always want to just put something bready on it. And it’s like she knew this about me. So, check out the photo of my dish below and her original photo. Twinsies or what?! In case you were wondering the class was $69/person. That included all of the food, a professional chef teaching the class, an assistant (who does all the dishes!) and a two hour hands-on class with 9 other people in a fully-equipped kitchen. I haven’t taken classes anywhere but Sur La Table so I have nothing to compare it to, but to me seemed like a very high-quality experience. There are just not a lot of places that offer classes near me otherwise I’d like to explore other places to compare. So all in all if you were to ask me if you should do it, I would definitely say YES — GO TAKE A COOKING CLASS! It’s worth it. Guys, it’s fun, you get to stuff your face and you just might learn a thing or two. And just look at that friendly/sister bonding right there. So fun to cook with others. 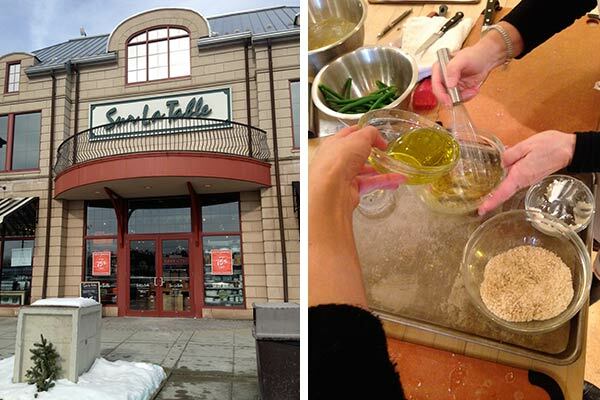 Have you taken a cooking class at Sur La Table or anywhere else? If so, leave me a comment below and let me know how your class went.